Install manually via MSI or with the Chocolatey package manager. 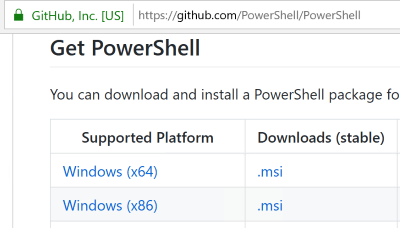 The primary way for installing PowerShell Core is to download the official MSI release from the PowerShell GitHub page. Scroll down to Get PowerShell and click the .msi link from the Downloads (stable) column for your version of Windows (either x86 or x64). Slightly different icon of PowerShell Core. The decision is clear: it is time to switch to PowerShell Core. A lot has happened since the last time I published a post (November 2017), including the release of PowerShell Core 6.0 in January 2018. An script for monitoring Digital Ocean feed. Use PowerShell’s Invoke-WebRequest to retrieve and parse an RSS or Atom feed. There are a lot of third party services that provide status monitoring updates through RSS/Atom feeds. Statuspage is a popular service that other companies use for providing this type of status monitoring feed, as well as a status page for web viewing. 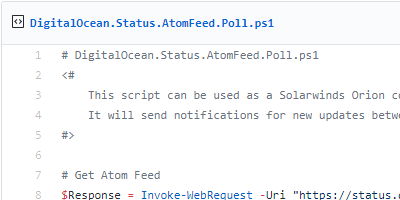 For my case, I wanted to take advantage of monitoring one of these status feeds, but I wanted to do it using PowerShell so I could send email alerts and display status information within Solarwinds Orion. Here is how I used the Atom feed from DigitalOcean‘s Statuspage. Use Get-PSSnapin to see loaded snapins. PowerShell snap-ins (PSSnapin) were the 1.0 way of extending PowerShell’s functionality. 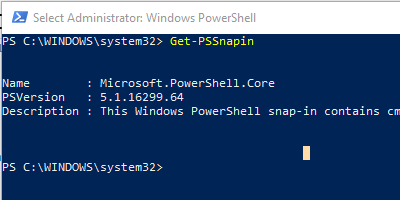 In this post of the series “PowerShell 1.0 – The First Cmdlets“, we will cover Get-PSSnapin , Add-PSSnapin , and Remove-PSSnapin , which encompass the cmdlets needed for managing PowerShell snap-ins. Display documentation for PowerShell components using Get-Help. 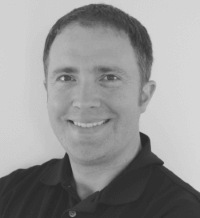 This is the first post in the series PowerShell 1.0 – The First Cmdlets. In this post we will cover Get-Help , which was one of the Microsoft.PowerShell.Core module cmdlets and a cmdlet we will use extensively in future posts. Note that though this cmdlet was first introduced in PowerShell 1.0, enhancements have been made through version releases and we will cover the latest features of the cmdlet. Get-Help displays help documentation for PowerShell cmdlets and concepts. It is the method from within PowerShell that you can bring up details of how to use PowerShell components. This cmdlet will be a regular part of your daily PowerShell toolbox. One of the most common ways you will use Get-Help is to get documentation about how to use a specific cmdlet. You type Get-Help followed by the cmdlet name you want documentation for, so an example would be Get-Help Get-Help . 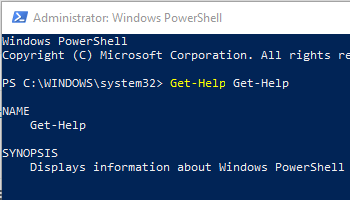 Run this from a PowerShell session to see the standard help displayed. There a few parameters to control the level of documentation to display, some being more verbose than others. -examples will show you the examples within the help file. -detailed will show a more complete documentation set, including examples as well as a breakdown of the Parameters. -full will show you everything included in -detailed as well as Input and Output information and general Notes. One of my favorite new features is to use the -online parameter to launch the help page for a given cmdlet or component that resides at docs.microsoft.com. The online help pages are well formatted and easy to navigate, so if you like to reference your documentation separate from where you are working or on a second screen (I personally do), this is a killer feature. In the next post of the series, we will cover the PSSnapin cmdlets, Get-PSSnapin , Add-PSSnapin , and Remove-PSSnapin .